On April 14, 1561, numerous residents of Nuremberg, Germany, saw hundreds of globes, cylinders, and other strange-shaped objects flying in darting patterns, as if fighting one another. The sighting lasted about an hour and was described by witnesses as a “very frightful spectacle.” An unknown artist recorded the event in a woodcarving, which shows the strange fleet of flying objects, including a few actually crashing to the Earth. On August 7, 1566, Samuel Coccius of Basel, England, wrote that at sunrise “many large black globes were seen in the air, moving before the sun with great speed and turning against each other as if fighting.” Coccius memorialized the event in a woodcarving, which shows about 40 objects filling the sky as stunned observers look on. Many astronomers have seen UFOs. The famous English astronomer, Edmund Halley, who discovered Halley’s comet, also claims to have seen a UFO. In May of 1677, he and numerous others observed a “great light in the sky all over southern England, many miles high.” The light moved “with incredible speed, and was very bright. It seemed to vanish and left a pale white light behind it. There were no hissing sounds and no explosion.” Was this a UFO or a meteor? Even Halley wasn’t sure. On July 9, 1686, German astronomer Gottfried Kirch observed a “burning globe” that was so bright “one could read without a candle.” He used a telescope and estimated that the object was 30 miles up. After eight minutes, the light disappeared. Kirch later learned that other people eight miles away observed the same object earlier that evening. On January 2, 1749, three large spherical-shaped objects “like the moon” appeared over Japan, causing widespread riots. The government was forced to enact martial law to stop the panic. 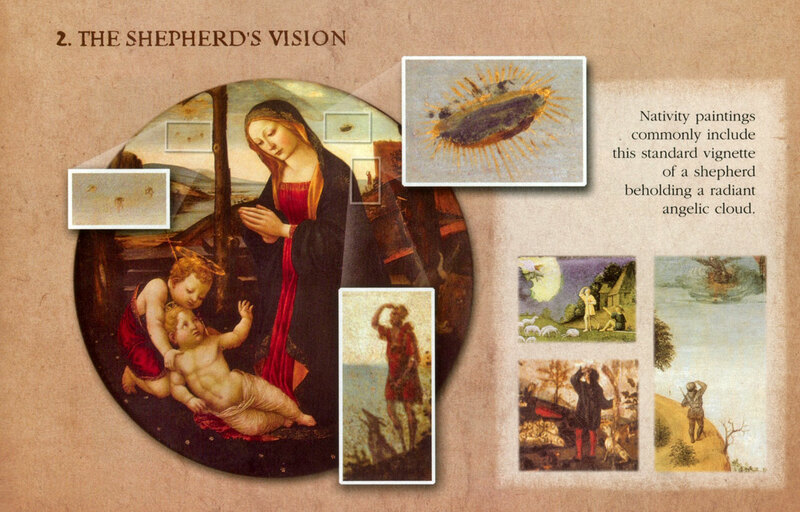 During this time, several Renaissance painters created works of art that contained images of typical flying saucers. In 2003, researcher Matthew Hurley identified many examples. A fifteenth-century painting by Italian artist Ghirlandaio shows the Virgin Mary with a diskshaped object hovering in the sky. In the background, a man points at the object. Another sixteenth-century fresco shows a figure inside a flying object that is darting across the sky above a crowd of people.